Metals are generally considered a good thermal conductor, that is they are generally good at allowing heat to pass through. Plastics and ceramics on the other hand are generally considered to have a poor thermal conductivity, meaning that they do not easily allow heat to pass through themselves. The reason for a good thermal conductor is thought to be down to the number of free electrons within the structure of the material, the heat energy is passed on to other free electrons in the structure which causes the heat energy to transfer quickly. An example of a good thermal conductor of heat is copper which has a thermal conductivity of 401 W·m−1·K−1 (W=watt m=metre K=Kelvin). The thermal conductivity of a material is defined as the amount of thermal energy per second that is able to pass through a 1m³ of the material under test. 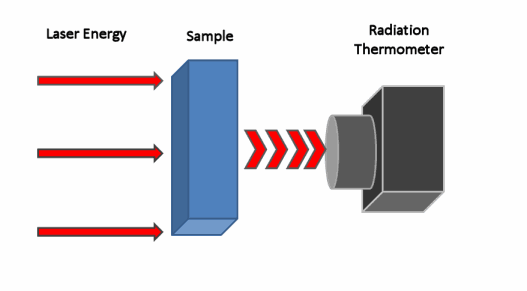 Laser flash analysis is one method used for the testing of thermal conductivity, in short a series of laser pulses causes one side of the test subject which is usually in the form of a thin disc to heat up, while the heat is being applied a radiation thermometer on the opposite side detects temperature change.